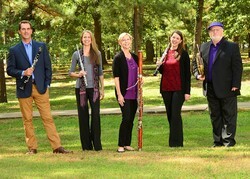 SFA's Stone Fort Wind Quintet includes, from left, Christopher Ayer, clarinet; Christina Guenther, flute; Lee Goodhew, bassoon; Abby Yeakle Held, oboe; and Charles Gavin, horn. NACOGDOCHES, Texas - The Stone Fort Wind Quintet at Stephen F. Austin State University will present a faculty recital at 7:30 p.m. Tuesday, Nov. 6, in Cole Concert Hall on the SFA campus as part of the Friends of Music Concert Series. The program includes works by Josef Foerster, Valerie Coleman, David Solomons, Matthew Bruemmer and Astor Piazzolla. The quintet includes SFA School of Music faculty members Charles Gavin, horn; Christopher Ayer, clarinet; Abby Yeakle Held, oboe; Christina Guenther, flute; and Lee Goodhew, bassoon. Brad Meyer will join his music colleagues as guest narrator and percussionist. The Quintet, op. 95 by Foerster is a Romantic work in four-movements, according to Guenther. "Thickly orchestrated, it is a large-scale work using the wind quintet in a very symphonic setting," she said. Solomons' "Thalia's Rag" is a wind quintet with added limericks for speaker. The limericks are interspersed throughout the piece, each coupled with one of the instruments. Meyer will provide narration. Coleman's "Red Clay and Mississippi Delta" is a rhythm-and-blues-inspired work, largely featuring the clarinet. She describes it as "a light scherzo work for wind quintet that references my family's background of living in Mississippi." "The solo lines are instilled with personality, meant to capture the listener's attention as they wail with 'bluesy' riffs that are accompanied ('comped') by the rest of the ensemble," she writes. "The result is a virtuosic chamber work that merges classical technique and orchestration with the blues dialect and charm of the South." Bruemmer describes his work "The Violent Rain's Mambo" as a "fast-moving, dance-like piece that is sure to catch the attention of every audience member." Focusing on the nuances of each instrument, the piece creates effects and sounds of a storm. Written while Piazzolla was living in Rome, "Libertango" is one of his most well-known pieces. He described it as "sort of a song of liberty." A hard-driving piece in his unique nuevo tango style, it has been transcribed for many different instrumental and vocal combinations and was on his first Italian album, also titled "Libertango." Meyer performs on this piece. The quintet will perform selections from this program on the group's Houston-area tour Nov. 7 through 9.